Mason and Keith Clements of Ray City, GA, were sons of James Irwin Clements and Annie Mae Carter Clements. Mason and Keith Clements attended Georgia Teachers College, now Georgia Southern University, in 1948. Keith graduated from Ray City High School with the RCHS Class of 1942 and Mason graduated with the RCHS Class of 1943. 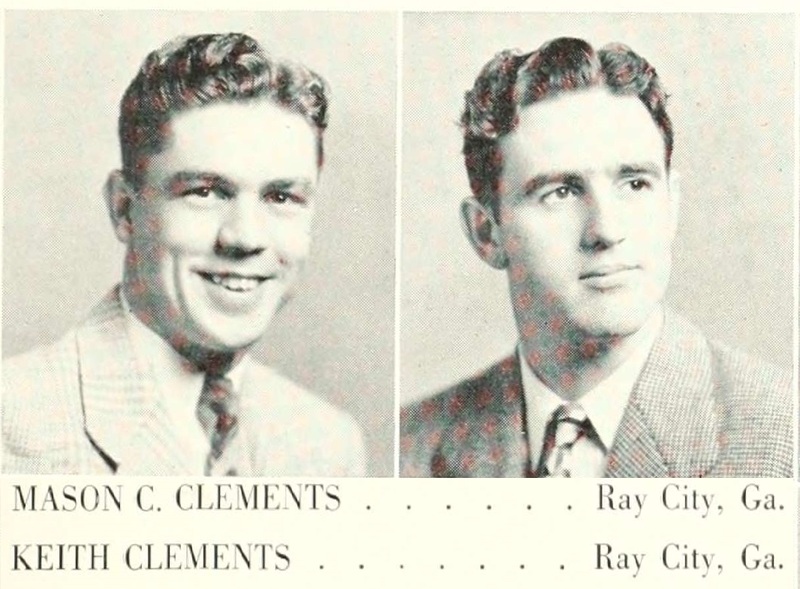 Their older brother, J.I.Clements graduated with the RCHS class of 1938. All three entered the service during WWII, and after the war all three made their way to Georgia Teachers College (now Georgia Southern University), Statesboro, GA. In 1948, Mason and Keith were undergraduates while J.I. Clements had already started his long career coaching and teaching physical education for the college. COLLEGEBORO, Ga. – The new baseball season will receive a four-day initiation at Georgia Teachers College this week. The Teacher nine will entertain Erskine College Wednesday and Thursday and North Georgia College Friday and Saturday. They will oppose Mercer University April 4 and Presbyterian College April 6 before making their first trip. With eight lettermen and five promising pitching recruits, the Professors are in for a good season, Coach J.I. Clement, Jr., says. Old hands who will retain positions are Mason Clements and Keith Clements of Ray City, the coach’s brothers, in the outfield; W.G. (Red) Bullock, Jr., of Valdosta, at first base; Roger Parsons of Harlan, Ky., at second base or in the outfield; Joe Middlebrooks of Warwick, catcher; and F.M. (Sonny) Clements of Rhine, unbeaten as a freshman pitcher last season. Keith married Joan Griffin, Georgia Teachers College Class of 1953, and went on to a career with a pharmaceutical company. Mason married Fay Joyner, Class of 1951, and went into the wholesale grocery business with his father-in-law in Augusta, GA.